JinnieJinyoungYoo, Ph.D. , Donghoo Kim, Ph.D. Student, Jang Ho Moon, Ph.D. While most of the studies on communication behaviors in SNSs to datehave been uni-cultural, which limits the validity and applicability of theirfindings, this study investigates the influence that culture exerts on socialrelationships and interpersonal communication in SNSs in two diametricallydifferent cultural contexts, the U.S. and Korea. Findings from the surveydata demonstrated that Koreans (i.e., members of collectivistic cultures)were concerned more about self-presentation in SNSs thanAmericans (i.e., members of individualistic cultures).Regarding users'self-disclosure in SNSs, the results demonstrated that Koreans were generallyless likely to disclose their personal information, yet more likely todisclose themselves with greater depth than Americans. Recently, as a venue for relationship formation and maintenance, SNSs have proliferated across the globe. For instance, SNSs such as Facebook and Twitter, both originated in the U.S., have expanded rapidly around the world and have gained high popularity in many Asian countries (e.g., Korea, Japan, Taiwan, etc.). According to Facebook's pressroom (2010), it has more than 500 million active users globally and about 70% of its users are outside the U.S. Also, the site has been translated into more than 70 languages. Indeed, Facebook is seeing an exploding presence in Asia. The July 2010 report, Inside Facebook Gold, which tracked Facebook's growth around the world, revealed that five of the top six countries gaining the most active new users per month were Asians. In particular, the report in-dicated that the growth rate of Facebook in Korea was immense. Specifically, throughout 2010, South Korea's Facebook membership more than doubled to 1,108,840 users (Inside Facebook Gold, July 2010). Despite the global popularity of SNSs, research examining the role of culture in its use and influence has been limited. The majority of SNSs re-search has been conducted in the context of the U.S. cultural environment (Christofides, Muise, and Desmarais, 2009; Ellison, Steinfield, and Lampe, 2007). This computer mediated communication, however, does not occur in a cultural void. It exists and operates in a social and cultural milieu wherein individuals acquire the fundamental values and norms that shape their social behaviors (de Mooij, 1998). Accordingly, communica-tion behaviors and social interaction via SNSs may differ across cultures since computer mediated communication should also reflect the dominant values and codes of the culture from which users originate (Boyd, 2008). To build our theoretical understanding of cross-cultural similarities and differences in how individuals are involved in SNSs, this study investigates the influence that culture exerts on social relationships and interpersonal communication in SNSs in two diametrically different cultural contexts, the U.S. and Korea. To investigate cultural effects on SNSs, this study explores cultural dif-ferences in two important communicative behaviors, self-disclosure and self-presentation. Despite the academic endeavors to understand the rap-idly growing use of SNSs, there have been few studies that investigated the motivations for, and consequences from, the uses of SNSs from the per-spective of interpersonal relationships (Park, Jin, and Jin, 2011). Although there are a variety of different purposes, the particular interests of this study are in self-disclosure and self-presentation in SNSs because diverse func-tions of SNS such as online profiles, wall posts, friends lists, online com-munities, and fan pages, which are hyperlinked with others' SNS pages are closely related to self-presentation (Donath and boyd, 2004; Ellison Steinfield, Lampe, 2007). Accordingly, this study attempts to increase our understanding and comprehension of SNS uses associated with inter-personal relationships across cultures focusing on users' self-presentation and self-disclosure. Self-presentation refers to how a communicator controls information about the self to make a good impression (Schlenker and Pontari, 2000). It is a goal-directed social behavior of controlling information of self in order to influence impressions formed by others (Goffman, 1959). In SNSs such as Facebook or MySpace, users can present themselves through managing anonline profile, wall postings, making comments, or joining communities. Since these functions are always under the control of users, presenting to others a desirable image is easier in an SNS context compared to real life. More specifically, differently from real life self-pre-sentation which is composed of verbal and non-verbal communication (e.g., physical appearance, gestures, tone of voice, and other behaviors), online self-presentation does not include many non-verbal cues due to the lack of affordances in the networking platforms (Jiang, Bruijn, and Angeli, 2009). Verbal communication can be more controlled since users can han-dle what and how to disclose. On the other hand, non-verbal communica-tion may be beyond the conscious control (Jiang, Bruijn, and Angeli, 2009). Given that users of SNSs have almost full control over the information they present, easily creating, modifying, and editing messages about the self, they may engage in self-presentation more actively and be more strategic in managing their self-image than in face-to-face interactions (Kramer and Winter, 2008). Therefore,self-presentation behaviors with the purpose of creating and maintaining a stable and favorable impression of the self (Arkin, 1986) have been employed by individuals to attempt to control oth-ers' perceptions, and they have been pervasive in social interaction (Leary, 1995; Leary and Kowalski, 1990) in computer mediated communications (CMC). This study further proposes that there will be cultural differences in the user's attention to self-presentation in SNSs. According to Markus and Kitayama (1991), people in different cultures may hold strikingly different construals of the self, others, and the interdependence of the two. In in-dividualistic cultures, people learn to perceive their selves as independent and autonomous entities. They are taught to maintain a consistent self-im-age that is separate from the social context and are encouraged to express the self, such as one's desires, preferences, and attributes. These cultural traits eventually foster an independent self, which has a clear boundary of the self from others and which is highlighted by social comparison with others (Markus and Kitayama, 1991). In contrast, collectivistic cultures foster an interdependent self, which is connected, fitted, and assimilated to situations or contexts (Markus and Kitayama, 1991). Internal attribu-tions of interdependent self, such as abilities, opinions, and personality, are subordinated to specific contextual situations. The contrast between individuals' self-views in two prototypical cultures is manifestedes-pecially in the way individuals develop and manage socialrelationships. In collectivistic cultures, people tend to attach valueto group identity, with a strong tendency to build lifetime relationships(de Mooij, 1998), whereas individualisticcultures highlight independence, resulting in fragmente-dand short-term relationships among one another (Hall, 1976). Collectivistic members willingly adapt themselves to given situations and relationships and tend to place the locus of faceonothers. Consequently, they are concerned about others' face as well as their own. In this argument, face refers to a projected image of one's self in a relational situation (Ting-Toomey, 1988). Given the concern of others' face-saving, members of collectivistic cultures may self-present not only to manage their own impressions but also to save others' face. On the contrary, mem-bers of individualistic cultures place the locus of face on the self and are more concerned about their own face-saving. These peoplehavemore in-ternal motivation for self-presentation, and such motivation is less affected by situational and relational conditions. H1: Korean SNS users (i.e., users from a collectivistic culture) will pay more attention to self-presentation than their American counterparts (i.e., users from an individualistic culture). Closely related to the concept of self-presentation is the degree to which people make themselves vulnerable through the social performance of identity. Self-disclosure, or the propensity an individual has for revealing personal information to others (Collins and Miller 1994; Derlegaet al. 1979), relates to the content of self-presentation. Self-disclosure plays an important role to develop relationships and form feeling of intimacy in in-terpersonal interactions (Altman and Taylor, 1973). Self-disclosure is commonly revealed in SNSs in a variety of ways to attract the attention of online friends or random visitors (Christofides, Muise and Desmarais, 2009). Mazer and his colleagues (2007) identify several SNS features that foster self-disclosure: users post personal in-formation such as pictures, hobbies, and messages to communicate with fellow students and instructors as well as friends and family. Building from Mazer and his colleagues' work and Petronio's (2002) treatment of self-dis-closure as coordinating boundaries around private information, Walther and his colleagues (2008) further noted that self-disclosure occurs along-side information about the self that is provided by other users (e.g., through wall posts or comments on status messages). The current study posits that cultural differences influence users' com-municationbehaviors on SNSs and that this is partly evident from their de-grees of self-disclosure.Previous research has shown that people from in-dividualistic cultures disclose themselves more than those from collectiv-istic cultures. For example, Chen (1995), comparing the levels of self-dis-closure between American and Taiwanese college students, found that American respondents tended to exhibit higher levels of self-disclosure on topics (e.g., opinions, interests, work, financial issues, personality, and body) and to target persons (e.g., parents, strangers, acquaintances, and intimate friends) than Taiwanese respondents. However, this result does not necessarily mean that those American students develop better relation-ships and form more intimacy than Taiwanese students. To further explain the cross-cultural differences in self-disclosure, it is important to recognize that self-disclosure is not a one-dimensional construct. According to Altman and Taylor (1983), there are two dimensions of self-disclosure: breadth and depth. Breadth of self-disclosure refers to frequency and tim-ing of self-disclosure and it is associated with relationship development and increasing intimacy. In contrast,depth of self-disclosure refers to the degree of intimacy when disclosing the self. While moving to the next stage of relationship development,information about the self changes from gen-eral to more personal,and even vulnerable information is pro-vided(Wheeless and Grotz, 1976). Given close relationships, especially in-groups, members of collectiv-istic cultures tend to exhibit more intimate self-disclosure than members of individualistic cultures. Strong in-group bonds and the significance of others in the relationship in collectivistic cultures may be related to a greater depth of self-disclosure. People from collectivistic cultures not only per-ceive higher levels of similarities with their in-group members but also ex-hibit more intimate and harmonious communication attitudes toward their in-group members than do those from individualistic cultures (Gudykunst et al., 1987).The findings of previous research support this cross-cultural difference in the breadth and depth of self-disclosure. For example, accord-ing to Ma (1996), self-disclosure in individualistic cultures often plays a role as an icebreaker in initial interactions. That is, a greater amount of self-disclosure can readily occur without intimacy. In collectivistic cul-tures where in-group interactions are salient compared to those with out-groups, self-disclosure is discouraged in the initial stages. Such self-disclosure to in-groups in collectivistic cultures exhibit higher levels of intimate information because it occurs among close relationships. There are a limited number of cross-cultural studies on self-disclosure in CMC. Kim and Papacharissi (2003) compared the homepages for U.S. Yahoo and Korea Yahoo and indicated that American users disclosed more about themselves than Koreans through their homepages and that this was consistent with findings in face-to-face interactions. Yum and Hara (2005) also reported that Americans were more likely to disclose personal in-formation than Koreans in a CMC setting. In fact, Yum and Hara (2005) expected that Korean users exhibited higher levels of intimate self-dis-closure than American users in an online community because they regarded an online community as an in-group bond. An opposite result to this expect-ation may indicate that an online community is not replaced with physical in-group bonds in that members are mostly composed of people who were not supported by existing social ties (family, school, and regional ties).This study attempts to establish that SNS settings differ from general online community settings. While the majority of SNS friends are known mem-bers based on actual offline relationships, online communities are more likely to be composed of members unknown to each other in the real world. Therefore, if relationship intimacy is involved in SNS self-disclosure, it will not differ from previous findings in face-to-face settings. That is, cul-tural differences in self-disclosure in face-to-face settings should be repro-duced in the SNS setting. H2: American SNS users will exhibit a greater breadth of self-disclosure than their Korean counterparts. H3: Korean SNS users will exhibit a greater depth of self-disclosure than their American counterparts. RQ1: Is there any differences in the degree of relationship intimacy in SNSs between Korean and American SNS users? RQ2: Is relationship intimacy related to depth and breadth of self-dis-closure in SNSs? If so, how? RQ3: Are self-presentation and self-disclosure related in the context of SNSs? If so, how? An online survey was conducted to investigate how American and Korean SNS users differ in self-presentation and self-disclosure in SNSs. The online survey was administered with two main sample groups: American and Korean undergraduate students who have been used SNSs.Through the survey, SNS usage data of each sample was collected during a short time span (from November to December, 2011) in an attempt to minimize the influence of external events. The participants were invited to the survey website designed for this study. Participants were first asked to fill out a questionnaire which measured their self-presentation, self-dis-closing tendency in SNSs, and the degree of closeness (intimacy) they had with their SNS friends. In the next section, participants filled out a ques-tionnaire that measured their self-construal and provided demographic information. For Korean participants, all measures were translated into Korean using the back-translation technique. To examine cross-cultural differences in self-presentation and self-dis-closure in SNSs, the data was collected in South Korea and the U.S. 134 Korean participants were selected among undergraduate students from three universities in Korea, and 169 American undergraduate students were recruited from a large public university in the US. American Sample. 35% of the American sample (N=69) were males and 65% (N=127) were females, and the average age was 21.5 years. 41.8% of the American students are using more than two SNSs, and 95.4% of them have been using Facebook as their primary SNS. Only 4% of respondents have had an SNS account for less than one year and approximately 70.4% have used at least one SNS for three or more years. About 55% of American students spend from one to two hours per day on SNSs, and 28% spend more than two hours per day onthem (see Table 1). Korean Sample. About 48% of Korean participants (N=63) were males and 54% (N=71) were females, and the average age of them was 24.8 years. 84.8% of the Korean students are using more than two SNSs, and 80.4% of them have been using Facebook, and 17.4% have been using Cyworld, a Korean local SNS, as their primary SNS. About two-thirds of the Korean participants (71.5%) have had their primary SNS account(mostly Facebook) for less than two years, and about 23% have used an SNS for three or more years. Most of Korean students (82.6%) spend less than an hour per day on SNSs, and only 4.4% spend more than two hours per day on them (see Table 1). In order to confirm the assumption that Korea represents a collectivistic culture, consisting of people with interdependent self-construals, and the U.S. represents an individualistic culture, consisting of people with in-dependent self-construals, Self Construal Scales developed by Gudykunstet al. (1994) was employed. The measure included 28 items of independent (Cronbach's = .92) and interdependent (Cronbach's = .88) self-construal, such as I prefer to be self-reliant rather than depend on oth-ers, Being able to take care of myself is a primary concern for me, I will sacrifice my self-interest for the benefit of my group, I respect decisions made by my group, etc. The scale ranged from 1=strongly disagree to 7=strongly agree on a 7-point Likert-type scale. This study sourced items from Self-Presentation measures (Cronbach's = .87) (Lee, et al., 1999) in order to examine the extent to which individuals pay attention to Self-presentation in SNSs. The modified 8-item measure included: I tell others about my positive qualities in SNSs,I act in ways I think others should act, I tend to make other people in SNSs aware of your talents or qualifications, etc. Each item was scored on a 7-point Likert scale (1=strongly disagree, 7=strongly agree). Self-disclosure was measured with a modified Self-Disclosure Scales developed by Wheeless (1978) and Wheeless and Grotz (1976). Five items measured the breadth of self-disclosure in SNSs (Cronbach's = .77), which included items such as I frequently talk about myself in SNSs and I usually write about myself extensively in SNSs. Five items used to measure the depth of self-disclosure (Cronbach's = .74) included I intimately disclose who I really am, openly and fully on my SNSs, I often disclose intimate, personal things about myself without hesitation, etc. Each item was scored on a 7-point Likert scale (1=strongly disagree, 7=strongly agree). Lastly, the relationship intimacy was measured with a modified Miller's Social Intimacy Scale (MSIS: Miller and Lefcourt, 1982). Of the 17 origi-nal questions, 11 questions (Cronbach's = .82) were used in the context of SNSs including How much do you feel like being encouraging and sup-portive to people in SNSs when they are unhappy? and How important is it to you that people in SNSs understand your feelings? Each item was scor-ed on a 7-point Likert scale (1=strongly disagree, 7=strongly agree). This study assumed that Korea represents a collectivistic culture, con-sisting of people with interdependent self-construals, and the U.S. repre-sents an individualistic culture, consisting of people with independent self-construals. To confirm the assumption, independent t-tests were conducted. The results showed that the American participants exhibited significantly stronger independent selves on the scale items of self-con-struals (Gudykunst et al., 1994) compared to the Korean participants (American = 69.3, Korean = 63.8, t = 4.190, p < .001). In contrast, the Korean participants were significantly higher on the inter-dependent-self measure compared to the American participants (American = 67.5, Korean = 72.2, t = 4.631, p < .001). This means that relatively more American participants had relatively high independent self-construals, whereas Koreans were more likely to have relatively high interdependent self-construals. This result is consistent with prior theory and supports the assumption of the present study. Cross-national differences in Self-presentation in SNS. This study hy-pothesized that users of SNSs from collectivistic cultures tend to pay more attention to self-presentation than those from individualistic cultures. To test the hypothesis, an independent samples t-test was conducted. 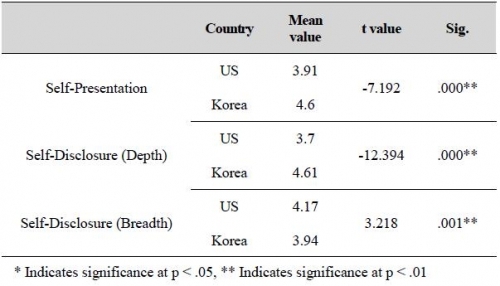 The test confirmed a significant difference in means between Korean and American participants (MUS = 3.91, MKorea= 4.60, t = -7.192, p < .001), thus, supporting H1 (see Table 1). This result indicates that people in the collec-tivistic culture (i.e., Korea) are more likely to be concerned about their self-presentation in SNSs than those in the individualistic culture (i.e., U.S.). Cross-national differences in Self-disclosure in SNSs. This study hy-pothesized that SNS users from individualistic cultures tend to exhibit a greater breadth (i.e., amount) of self-disclosure than users from collectiv-istic cultures, and those who are from collectivistic cultures tend to exhibit a greater depth (i.e., intimacy) of self-disclosure than those from in-dividualistic cultures. To test the hypotheses, two independent samples t-tests were conducted. The results showed that, Americansself-disclosed more than Koreans (MUS= 4.17 vs. MKorea= 3.94, t = 3.218, p = .001), whereas Koreans sharedmore intimate personal information than Americans (MUS= 3.70 vs. MKorea= 4.61, t = - 12.394, p < .001), thus supporting H2 and H3 (see Table 2).This result demonstrates that people in the collectivistic culture (i.e., Korea) are likely to disclose information about themselves with greater depth in SNSs than those in the in-dividualistic culture (i.e., U.S.) while people in the individualistic culture tend to disclose themselves with greater breadth in SNSs than those in the collectivistic culture. Additionally,a correlation analysis was conducted to determine how self-presentation and self-disclosure were related in the context of SNSs.The result showed that self-presentation in SNSs was positively cor-related with the depth of self-disclosure (r  = .322, p <.001) and neg-atively correlated with the breadth of self-disclosure (r  = -.176, p = .003) in SNSs. That is, users who were more concerned about self-pre-sentation in SNSs are likely to disclose themselves with a greater depth but with a low level of breadth (see Table 3). Cross national difference in SNS relationship with friends. Regarding the number of friends in SNSs, the results showed that American users have a relatively greater number of friends than Korean users do. Specifically, while the majority of American users (80.1%) have more than 300 friends, only 5.5% of Korean users have more than 300 friends in their primary SNS. 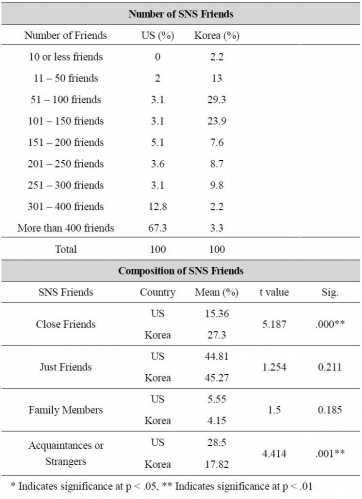 More than two-thirds of Korean users have less than 150 friends in their primary SNS. An independent samples t-test was conducted to examine possible cross-cultural differences in users'SNS relationships with friends (see Table 4). The results demonstrated that Korean users had a higher percentage of close friends (27.3%) on their friends list compared to Americans (15.4%), t = 5.287, p < .001, while Americans included more acquaintances or strangers (28.5%) on their SNS friends lists than Koreans (17.8%), t = 4.141, p < .001. The large portion of acquaintances or strangers may indicate that Americans are more open to develop and increase their SNS relationships than Koreans. These significant differences imply that those who are more individualistic have a greater number of friends, whereas those who are more collectivistic maintain more intimate relationships in SNSs (see Table 4). In addition, the results also showed a significant cross-national differ-ence in perceived relationship closeness with SNS friends. The results showed that Korean participants were more willing to maintain intimate relationships with their SNS friends compared to American participants (MUS= 4.03 vs. MKorea= 4.86, t = -2.143, p = .033) (see Table 5). 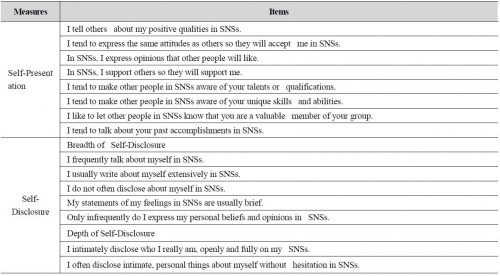 This may support the results that Korean users self-disclose with greater depth than Americans, indicating that members of collectivistic cultures, who maintain closer relationship with their SNS friends, are more likely to pos-sess a higher level of depth of self-disclosure (see Table 5). Cross-national differences in the influence of SNS relationship in-timacy on self-disclosure. To determine if the degree of relationship in-timacy influences in SNSs have an effect on users' depth and breadth of self-disclosure, a series of regression analyses were conducted. The results show that, for Korean participants, the relationship intimacy significantly predicted the depth and breadth of self-disclosure. Specifically, as the de-gree of relationship intimacy increased, Korean participants exhibited higher levels of depth (B = .854, = .541, t = 6.095, p < .001) and breadth (B = .344, = .218, t = 2.120, p = .037) of self-disclosure. However, for American participants, no significant relationship was found between the relationship intimacy and depth (B = .007, = .050, t = .695, p = .488) and breadth (B = .003, = .022, t = .300, p = .765) of self-dis-closure (see Table 5). Additionally, the relationship intimacy did not sig-nificantly predict self-presentation for both Korean and American participants. Throughout self-presentation and depth and breadth of self-dis-closure,this study aimed to endorse the assumption that individuals' cul-tural differenceselicited distinct communicative behaviors in SNSs. Findings from the survey data demonstrated that Koreans are more con-cerned about self-presentation in SNSs than Americans. This result implies that Koreans, who are collectivistic, mind others' assessment of one's self and, accordingly, are concerned with self-presentation to make a good impression. In collectivistic cultures, individuals' behaviors rely highly on situational and relational factors (Ting-Toomey, 1988). Such cultural atti-tudes, including self-construal by their social roles and the higher level of concern of other-face saving, readily lead them to pay more attention to audiences' expectations (Cho, 2010). Regarding users' self-disclosure in SNSs, the results demonstrated that members of collectivistic cultures were generally less likely to disclose their personal information, yet more likely to disclose themselves with greater depth than members of individualistic cultures. This result may in-dicate that members of collectivistic cultures disclosed less personal in-formation, but once they did, they willingly share intimate personal in-formation with others, compared to members of individualistic cultures. This corresponds with collectivistic cultural values that restrain people from directly expressing the self, including personal opinions and emo-tions in public (Chen, 1995; Yum and Hara, 2005). In collectivistic cultures, humility is highly valued. Such a cultural value leads to lower self-dis-closure with self-effacing attitudes. On the contrary, individualistic cul-tures tend to value the expression of high self-esteem, which encourages members to disclose personal information more openly in order to in-troduce their uniqueness. In addition, the smaller amount of self-disclosure in collectivistic cultures may be related to interdependent self-construal, whereby one construes the self-referring to others' thoughts, feelings, and actions rather than referring to one's own internal thoughts, feelings, and actions (Markus and Kitayama, 1991). Although there have been many cross-cultural studies investigating cultural differences in self-disclosure dealing with the amount of self-disclosure,few studies examined cultural effects on self-disclosure using other dimensions of self-disclosure, in-cluding depth of self-disclosure (Wheeless et al., 1986). This study added an empirical finding with the extended dimensions of self-disclosure in a CMC setting, by demonstrating that a higher degree of relationship close-ness with SNS friends heightens the depth of self-disclosure among SNS users from collectivistic cultures. Additionally, this study found that there was a significant correlation between self-presentation and self-disclosure in SNSs. Previous research has suggested that the concept of self-presentation is closely related to self-disclosure (Collins and Miller 1994; Derlega et al. 1979). According to the research, people who are concerned about self-presentation often repress personal information or supplant it with modified or fabricated de-tails more congruent with a desired self (Kelly and McKillop, 1996). 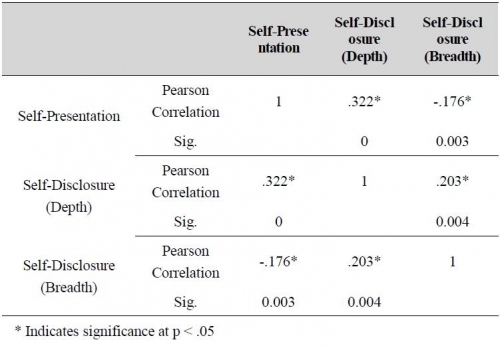 Findings of this study demonstrated that individuals who were high in self-presentation levels also revealed high levels of depth of self-dis-closure, while they revealed low levels of breadth of self-disclosure. This means that people who are highly concerned about self-presentation in SNSs are likely to disclose more intimate information about themselves, but the amount of information tends to be small. The results may have a number of implications for marketing communi-cation practitioners who are willing to promote their brands or products using SNSs. Marketing success through SNSs may be found if companies listen, watch and act on theonline activities of their consumers, who are communicating directly, and providing positive andnegative feedback about the brand. It is important for companies to understand the needs, de-sires, and motivations of consumers and offer communications which help create and maintain close relationships with them. Self-presentation and self-disclosure are taken into consideration when interacting on SNSs, where personal restrictions are put on the postings, comments, and photos shared as well as on the Fan Pages joined, suggesting an ideal identity portrayal (Smith and Wood, 2001). SNSs are places where many members choose to view their opinions and disclose parts of their private life. People are careful with what they choose to display and what information is in their profile. People choose whatto disclose and to what extent, based on approval seeking from their friends in forms of comments and response to pictures theydisplayed or statements they wrote, managing their impression to others (Smith and Wood, 2001). A lot of thought may be put into which brand Fan Pages they become a member of since it may bean indication of their thoughts and opinions. Further, SNS users may join a brand Fan Page as a way of self-expression. Given the cross-national differences in SNS users' self-presentation and self-disclosure this study proposed, marketing communication pro-fessionals may consider customizing the ways their brand Fan Page is man-aged as well as the types of messages they deliver depending on the cultural background and characteristics of their target audiences. For example, in order to attract Korean SNS users, marketers may put efforts on building or maintaining more intimate relationships with their consumers and se-lectively provide messages that can be used as a way of promoting their self-presentation. On the other hand, for American SNS users, marketers may try to provide interesting and informative messages they can share with their broad range of SNS friends. While this study contributes to understanding important cross-cultural differences in users' attitudes and behaviors in SNSs, especially focusing on users' self-presentation and self-disclosure in SNSs, it is important to acknowledge several methodological and sampling limitations. First, this study assumed that Korea represents a collectivistic culture and the U.S. represents an individualistic culture. Although the U.S. and Korea have been treated respectively as prototypic representatives of individualistic and collectivist cultures, to confirm the cross-cultural differences in self-presentation and self-disclosure in SNSs and subsequent attitudes andbehaviors, additional empirical investigations are needed that examine other individualistic and collectivistic countries. The second concern is that there might be sampling biases. This study employednot random sampling but convenience sampling. Due to the re-cruitment of participants ina university in each country, the sample has a limitation to represent lager SNS usergroups. In addition, although college students are a major population of SNSs, agelimitation, which could offset the effect of participants' cultural orientations on SNSbehaviors and atti-tudes, is also posed. Given cultural dynamics of younger generations,the results might be susceptible to some bias when comparing results of the two samples.Half of the American sample was first- and second-year col-lege students and more than half of theKorean sample was juniors and seniors. If a study cannot comprehensively include allstrata from each pop-ulation, it may create new problems when trying to compare groupsthat are not homogeneous across their major characteristics. Future research might designthe two sampling frames to be consistent with each other to allow for morestraightforward comparability between the samples. Third, while this study asked about general attitudes and behaviors in SNSs, the primary SNS of most of the participants was Facebook. For this reason, the findings might be limited to the usage patterns of Facebook rather than explaining general usage patterns in SNSs. Further, some of the Korean participants have been using Cyworld, a local Korean SNS, as their primary SNS. Although the number of Cyworld users was relatively small, different usage patterns owing to different functions and platforms of Cyworld might bias the results. In future research, those differences among different types of SNSs should be taken into consideration. In addi-tion, comparisons between user groups from differentcultural orientations within primary domestic SNSsmay also be needed even though different types of SNS tools cause different communicative conditions. It isbecauseSNS tools could be developed reflecting cultural attitudes of the major user groups. Future research should be conducted not only between cultural groups but also between cultural groups from the same cultural orientations, such as among Chinese in QQ,Japanese in Mixi, and Koreans in Cyworld. This study includes diverse possibilities to develop research topics. First, it explored only the degree of attention to self-presentation, yet cross-cultural studieshave shown different types of self-presentation be-tween individualistic and collectivisticcultures (Kim et al., 2003). A future study may explore culturally different types of self-presentation in SNSs. Next, gender may be a significant indicator as influential as culturebecause previous studies have shown that women tend to show greater concern oversocial relationships than men, and SNSs are closely involved with so-cial relationships. 1.Aaker, J. L., and Maheswaran, D. (1997).The effect of cultural orientation onpersuasion. Journal of Consumer Research, 24(2), 315328. 2.Arkin, R. M. (1986). Self-presentation strategies and sequelae. In S. L. Zehen (Ed. ), Self-presentation (pp. 5-29). New York: Springer-Verlag. 3.Altman, I. & Taylor, D., (1983). Social penetration: The development of interpersonal relationships. NewYork: Holt, Rinehart and Winston. 5.Boyd, D. M. (2008). Why youth (heart) social network sites: The role of networkedpublics in teenage social life. In D. Buckingham (Ed. ), Youth, identity, and digitalmedia (pp. 119142). Cambridge, MA: MIT Press. 6.Boyd, D. M., and Ellison, N. B. (2007). Social network sites: Definition, history, andscholarship. Journal of Computer-Mediated Communication, 13(1). http://jcmc.indiana.edu/vol13/issue1/boyd.ellison.html. 7.Chau, P., Cole, M., Massey, A., Montoya-Weiss, M. and O'Keefe, R. (2002).Cultural differences in the online behavior of consumers, Communications of the ACM, 45(10), 128-143. 8.Chen, G. M. (1995). Differences in self-disclosure patterns among Americans versusChinese. Journal of Cross-cultural Psychology, 26, 84-91. 9.Chen, Y_R.,Brockner, J., and Katz, T., (1998). Toward an explanation of culturaldifferences in in-group favoritism: The role of individual versus collectiveprimacy. Journal of Personality and Social Psychology, 75, 1450-1502. 10.Cho, B., Up, K., Gentry, J. W., Jun, S., andKropp, F. (1999). Cultural values reflected intheme and execution: A comparative study of US and Korean televisioncommercials. Journal of Advertising, 28(4), 5973. 11.Choi, S., Kim, Y., Sung, Y., and Sohn, D. (2011).Bridging of bonding. Information, Communication & Society, 14(1), 107-129. 12.Christofides, E., Muise, A., andDesmarais, S. (2009). Information disclosure and controlon Facebook: Are they two sides of the same coin or two different processes? Cyber Psychology & Behavior, 12, 341-345. 13.Church, A. T., Katigbak, M. S., Del Prado, A. M. Ortiz, F. A. and Mastor, K. A. (2006). Implicit Theories and Self-Perceptions of Traitedness across Cultures: Toward Integration of Cultural and Trait Psychology Perspectives. Journal of Cross-Cultural Psychology, 37, 694-716. 14.Collins, N. L., and Miller, L. C. (1994). Self-disclosure and liking: A meta-analytic review. Psychological Bulletin, 116, 457-475. Cousins, S. (1989). Culture and selfhood in Japan and the U.S. Journalof Personality and Social Psychology, 56,124-131. 15.deMooij, M. (1998). Global marketing and advertising: Understanding cultural paradoxes. Thousand Oaks, CA: Sage. 16.Derlega, V.J., Winstead, B., Wong, P.,and Greenspan, M. (1987). Self-disclosure and relationship development: An attributional analysis. In M.E. Roloff& G.R. Miller (Eds. ), Interpersonal processes: New directions in communication research, 172-187. Thousand Oaks, CA:Sage. 17.Dindia, K. (2002). Self-disclosure research: Knowledge through meta-analysis. In M. Allen, R. W.Preiss, B. M. Gayle, & N. A. Burrell (Eds. ), Interpersonal communication research: Advances through meta-analysis (pp. 169-185). Mahwah, NJ: Lawrence Erlbaum. 18.Dominick, J. (1999). Who do you think you are? Personal home pages and self-presentation on the World Wide Web. Journalism and Mass Communication Quarterly, 46, 250-268. 19.Donath, J. and body, D. (2004). Public displays of connection. BT Technology Journal, 22,71-82. 20.Eldon, E. (2010). ComScore, Quantcast, Compete, Nielsen show a strong Decemberfor Facebook traffic in the US January 22nd, 2010. Retrieved from http://www.insidefacebook.com/2010/01/22/comscore-quantcast-compete-show-a-strong-december-forfacebook-traffic-in-the-us/. 21.Ellison, N., Heino, R., and Gibbs, J. (2006). Managing impressions online: Self-presentation processes in the online dating environment. Journal of Computer-Mediated Communication, 11(2). 22.Ellison, N., Steinfield, C., and Lampe, C. (2007). The benefits of Facebook friends: Social capital and college students' use of social online networks. Journal of Computer-Mediated Communication, 11(2). 24.Facebook Pressroom (2010). Retrieved from http://www.facebook.com/press/info.php?statistics. 25.French, D. C., Bae, A, Pidada, S., and Lee, O. A. (2006).Friedships of Indonesian, South Korean, and U.S. college students. Personal Relationships, 13, 69-81. 26.Gangestad, A. and Snyder, M. (2000).Self-monitoring: Appraisal and reappraisal. Psychological Bulletin, 126, 530-555. 27.Gibbs, J.L., Ellison, N.B., and heino, R.D. (2006). Social exclusion and selective memory: How the need to belong influences memory for social events. Personality and Social Psychology Bulletin, 26(4), 486-496. 28.Goh, B. (2009). Asian social networking sites profit from virtual money. Reuters. Retrieved from http://www.reuters.com/article/idUSTRE5 8800D20090909. 29.Goffman, A. (1959). The presentation of self in everyday life. Garden City, N.Y.:Doubleday. 30.Gudykunst, W. B., Matsumoto, Y., Ting-Toomey, S., Nishida, T., Kim, K. S., &Heyman,S. (1996). The influence of cultural individualism-collectivism, self construals,and individual values on communication styles across cultures. HumanCommunication Research, 22, 510-543. 31.Gudykunst, W. B. and Nishida, T. (1986). The influence of cultural variability onperceptions of communication behavior associated with relationship terms.Human Communication Research, 13, 147-166. 32.Gudykunst, W. B., Yoon, Y-C., and Nishida, T. (1987).The influence of individualism-collectivismon perceptions of communication in in-group and out-grouprelationships. Communication Monographs, 54, 295-305. 33.Hall, E. T. (1976). Beyond culture.Gardon City, NY: Doubleday and Company. 34.Hofstede, G. (1980). Culture's consequences. Beverly Hills, CA: Sage. 35.Hofstede, G. H. (1984). Culture's consequences: International differences in workrelatedvalues. Beverly Hills, CA: Sage. 36.Hofstede, G. H. (2001). Culture's consequences: Comparing values, behaviors, institutions, and organizations across nations. 2nd ed. Thousand Oaks, CA: SagePublications. 37.Hall, E.T. (1976). Beyond culture.Doubleday:NewYork. 38.Hargittati, E. (2007), Whose space? Difference among user and non-users of social network sites.Journal of Computer-Mediated Communication, 13(1). http://jcmc,indiana,edu/vol13/ issue1/hartittai.htmlRetrrieved 20.02.08. 40.Ishii, K. and Ogasahara, M. (2007). Links between real and virtual networks: a comparative study of online communities in Japan and Korea, Cyberpsychology& Behavior, 10(2), 252-257. 41.Jiang, Y., de Bruijn, O., and De Angeli, A. (2009).The perception of Cultural differences in online self-presentation.T.Gloss et al.(Eds. ): INTERACT 2009, Part 1, LNCS 5726, 672-685. 42.Joinson, A.N., (2001). Self-disclosure in computer-mediated communication: The role of self-awareness and visual anonymity. European Journal of Social Psychology, 3, 177-192. 43.Kelly, Anita E. andMcKillop, K. J. (1996).Consequences ofRevealing Personal Secrets, Psychological Bulletin, 120 (3),450465. 44.Kim, J., Kim, M-S., Kam, K. Y., and Shin, H-C.(2003). Influence of self-construals on theperception of different self-presentation styles in Korea. Asian Journal of Social Psychology, 6, 89-101. 45.Kim, H. andPapacharissi, Z. (2003). Cross-cultural differences in online self-presentation:A content analysis of personal Korean and US home pages. AsianJournal of Communication, 13, 100-119. 46.Kirkman, B. L., Lowe, K. B., and Gibson, C. B. (2006). A quarter century of culture'sconsequences: A review of empirical research incorporating Hofstede's culturalvalues framework. Journal of International Business Studies, 37, 285-320. 48.Kramer, N. C., andWinter, S. (2008). Impression management 2.0: The relationship of self-esteem,extraversion, self-efficacy, and self-presentation within social networking sites. Journal of Media Psychology, 20, 106-116. 49.Laureneau, J.P., Feldman Barrett, L., and Pietromonaco, P.R. (1998). Intimacy as an interpersonal process: The importance of self-disclosure, partner disclosure, and perceived partner responsiveness in interpersonal exchanges. Journal of Personality and Social Psychology, 74, 1238-1251. 50.Laurenceau, J.P., and Kleinman, B.M. (2006).Intimacy in personal relationships. In A.L. Vangelisti& D. Perlman (Eds. ), The Cambridge handbook of personal relationships, 637-653, New York: Cambridge University Press. 51.Lee, S-J., Quigley, B. M., Nesler, M. S., Corbett, A. B., andTedeschi, J. T. (1999). Development of a self-presentation tactics scale. Personality and Individual Differences, 26, 701-722. 52.Leary, M. R. (1995). Self-presentation: Impression management and interpersonal behavior. Madison, WI: W. C. B. Brown & Benchmark. 53.Leary, M. R., and Kowalski, R. M. (1990). Impression management: A literature review and two component model. Psychological Bulletin, 107, 14-47. 54.Lenhart, A. (2007). Social networking websites and teens: An overview. Pew internet & American Life Project. http://www.pewinternet.org/pdfs/PIP_SNS_Data_Memo_Jan_2007.pdf Retrieved 20.02.10. 55.Levitt, T. (1983). After the sale is over. Harvard Business Review, 61, 8793. 56.Ma, R. (1996). Computer-mediated conversations as a new dimension of interculturalcommunication between East Asian and North American college students.In S.C. Herring (Ed. ).Computer-mediated communication: Linguistic, social andcross-cultural perspectives (pp. 173-185). Amsterdam: John Benjamins Publishing Co.
57.Markus, H. R. andKitayama, S. (1991). Culture and the self: Implications for cognition, emotion, and motivation. Psychological Review, 98, 224-253. 58.Mazer, J. P., Murphy, R. E., and Simonds, C. J. (2007). I'll see you on Facebook: The effects of computermediated teacher self-disclosure on student motivation, affective learning, and classroom climate. Communication Education, 56, 1-17. 59.Miller, R. S., andLefcourt, H. M. (1982).The assessment of social intimacy. Journal of Personality Assessment, 46(5), 514-518. 60.Moon, Y. S., andFranke, G. R. (2000). Cultural influences on agency practitioners'ethical perceptions: A comparison of Korea and the US. Journal of Advertising, 29(1), 5165. 61.Nezleck, J. B., and Leary, M. R. (2002).Individual differences in self-presentational motives in daily social interaction. Journal of Personality and Social Psychology, 28(2), 211-223. 64.Park, C., and Jun, J. (2003). A cross-cultural comparison of Internet buying behavior: Effects of Internet usage, perceived risks, and innovativeness. International Marketing Review, 20(5), 534553. 65.Park, N., Jin, B. and Jin, S. A. (2011).Effects of self-disclosure on relational intimacy in Facebook, Computers in Human Behavior, 27, 19741983. 66.Patterson, M.L. (1984). Intimacy, social control, and nonverbal involvement: A functional approach. In V.J. Derlega (Ed. ), Communication, intimacy, and close relationships, 105-132. New York: Academic Press. 67.Petronio, S. (2002).Boundaries of privacy: Dialectics of disclosure. Albany: State University of New York. 68.Schau, H. J., andGilly, M. C. (2003). We are what we post? Self-presentation in personal web space. Journal of Consumer Research, 30(3), 385-404. 69.Schlenker, B. (2004). Self-presentation.In M. R. Levy and J. P. Tangney (Eds. ), Handbook of self and identity (pp. 492-518). New York: Guilford Press. 70.Schlenker, B. R., Miller, R. S., and Leary, M. R. (1983).Self-presentation as a functionof the validity and quality of past performance. Represent ative Research in Social Psychology, 13, 2-14. 71.Schlenker, B. R. andPontari, B. A. (2000). The strategic control of information: Impression management and self-presentation in daily life. In A. Tesser, R.Felson, & J. Suls (Eds. ).Perspective on Self and Identity (pp. 199-232).Washington, DC: American Psychological Association. 72.Snyder, M. (1987).Public appearances, private realities: The psychology of self-monitoring. New York: Freeman. 73.Snyder, M., andGangestad, S. (1986). On the nature of self-monitoring: Matters of assessment, matters of validity. Journal of Personality and Social Psychology, 51, 125-139. 74.Taylor, D., and Altman, I. (1987). Communication in interpersonal relationships: Social penetration processes. In M. E. Roloff& G. R. Miller (Eds. ), Interpersonal processes: New directions in communication research (pp. 257-277). Thousand Oaks, CA: Sage. 75.Tidwell, L. C., and Walther, J. B. (2002). Computer-mediated communication effects on disclosure, impression, and interpersonal evaluations: Getting to know one another one bit at a time. Human Communication Research, 28, 317-348. 76.Ting-Toomey, S. (1988). Intercultural conflict styles; A face-negotiation theory. In Y. Y.,Kim & W. B., Gudykunst, (Eds.) Theories in intercultural communication. (pp.213-235). London: SAGE publications. 77.Triandis, H. C. (1986). Collectivism vs. individualism: A reconceptualiztion of a basicconcept in cross-cultural social psychology. In C. Bagley & G. K. Verma (Eds. ),Personality, cognition and values: Cross-cultural perspectives of childhood andadolescence. London: Macmillan. 78.Triandis, H. C. (1989). The self and social behavior in differing cultural contexts. Psychological Review, 3, 506-520. 79.Triandis, H. C., Bontempo, R., Villareal, M., Asai, M. and Lucca, N. (1988). Individualismand collectivism: Cross-cultural perspectives on self-ingroup relationships. Journal of Personality and Social Psychology, 54, 323-338. 80.Triandis, H. C. (1995). Collectivism and individualism. Boulder, Colorad Westview Press. 81.Triandis, H. C., Bontempo, R., Villareal, M., Asai, M. & Lucca, N. (1988). Individualismand collectivism: Cross-cultural perspectives on self-ingroup relationships. Journal of Personality and Social Psychology, 54, 323-338. 82.Walther, J. B. (1992). Interpersonal effects in computer-mediated interaction: A relational perspective. Communication Research, 19, 52-90. 83.Walther, J. B., andBurgoon, J. K. (1992).Relational communication in computer-mediated interaction. Human Communication Research, 19, 50-88. 84.Walther, J.B., Slovacek, C.L., and Tidwell, L.C., (2001). Is a picture worth a thousand words? : Photographic images in long-term and short-term computer-mediated communication. Communication Research, 28(1), 105-134. 85.Walther, J. B., Van Der Heide, B., Kim, S., Westerman, D., and Tong, S. T. (2008). The role of friends' behavior on evaluations of individuals' Facebook profiles: Are we known by the company we keep? Human Communication Research, 34, 28-49. 86.Wellman, B., Salaff, J., Dimitrova, D., Farton, L., Gulia, M., and Haythornthwaite, C. (1996). Computer networks as social network: Collaborative work, telework, and virtual community. Annual Review of Sociology, 22, 213-238. 87.Wheeler, L., Reis, H. T., and Bond, M. H. (1989).Collectivism-individualism in everydaylife. The middle kingdom and the melting pot. Journal of Personality and SocialPsychology, 57, 79-86. 88.Wheeless, L. R., (1978).A follow-up study of the relationships among trust, disclosure, and interpersonal solidarity. Human Communication Research, 4, 143-157. 89.Wheeless, L. R., Erickson, K. V., and Behrens, J. S. (1986).Cultural differences indisclosiveness as a function of locus of control. Communication Monographs, 23,36-46. Wheeless, L. R. andGrotz, J. (1976).Conceptualization and measurement of reported self-disclosure. Human Communication Research, 2, 338-346. 90.Yum, Y.O., and Hara, K. (2005). Computer-mediated relationship development: Across-cultural comparison. Journal of Computer-Mediated Communication, 11,article 7. http://jcmc.indiana.edu/vol11/issue1/ yum.html. 92.Zuckerman, M. (1979). Attribution of success and failure revisited, or:The motivational bias is alive and well in attribution theory. Journalof Personality, 47, 245-287.